It's been five years since I posted this film, "Tibetan Refugee." Hear for yourself in Tibetan's own words why they left Tibet to escape the conditions in Tibet under Chinese occupation. Appearances by his Holiness the Dalai Lama. Join Professor and Tibetologist Dr. Robert Thurman as he takes a journey into Tibet, giving a tour of Lhasa, the Potala Palace, the monasteries their, Shigatse, Gyantse, all the way to Mt. Kailash where he makes a dangerous trek around the most sacred mountain on earth and leads his group to the waters of Lake Mansarovar. If i may, having been to tibet, made a documentary there, having been to dharamsala, made a documentary there and studied the history of the tibetan people, especially the invasion of the tibet by the british in 1906. I've been to dharamsala a few times, and have taken a class in Tibetan philosophy with Robert Thurman. That's all a way of saying I've studied their history, I've studied the history of the monasteries in Tibet, the various Dalai Lamas and their political structures, and have read nearly all accounts of tibet from western points of view. Charles Bell's books are excellent, as he became friends with the 13th Dalai Lama, lived freely as a british soldier in Lhasa for over a dozen years, and his books paint an excellent description of both common and higher placed people. There was a lot wrong (by western standards) with the feudal system, but it was the one they were trying to change when the 14th showed up and was chased from his country by the Chinese. My documentary "Tibetan Refugee" interviews Tibetans who've just fled Tibet (shot in 2000) and in their own words speak why they fled. Tibetans can learn Tibetan in school, but only if they pay for it. Tibetans cannot hold jobs that Chinese people want. Tibetans are treated "like slaves" - i interviewed a Doctor who left because he was being forced to give women abortions who didn't want them. I spoke to ten Han businessmen in Lhasa who said variations of "I hate Tibetans, I hate their food, I hate their climate, I hate everything about being here - but I'm paid triple wages by the govt to come here." All ten told me they'd move back home the moment the money dried up. Penn & Teller's account is laughable - starting with the premise that Buddhism is a religion and that the Dalai Lama is a God. Neither is the case. The Dalai Lama calls themselves a "non theistic religion" which the last time I looked means atheist. No belief involved. No belief in a higher power involved. No gods. Just an examination into the nature of reality. It was Tsong Khapa, founder of the Gelupka order in the 14th century, who claimed that the 1st Dalai Lama was his teacher, and he knew the 2nd as well. They began an elaborate system of testing reincarnated people - and it carried for the past six centuries, and wasn't picked up by the West until Ian Stevenson, Carol Bowman at UVA began examining cases of reincarnation (from western science standards) for decades. But not centuries. The idea that the Tibetans are somehow masters of their own fate, masters of the prisons (I interview a number of survivors from Drapchi prison) is just nonsense. It's the equivalent of saying slavery was good for the slaves, as it got them out of the tropics. (Yes, I've heard Chinese engineers talk about the great roads and electricity in Tibet - and I've used them - but no one wants to be there who isn't from there. The Han women who get pregnant HAVE to leave, as they get birth defects at the high altitude. So let's start there - basically if you're going to write about a place, I suggest going there. Not hard to do, many companies offer trips. Lhasa may seem like a Disneyland resort now - but if you spend a few days there, you'll find the Tibetan people, despite the boot that's been put on their heads, are resilient people, and their faith and culture is hidden from public view. It's there. Ingrained in their courage to withstand the onslaught. But that's just me. the two dox, if you're curious, are free on youtube, "tibetan refugee" and "Journey into Tibet with Robert Thurman" - i made them free so people could see for themselves, without having to take a plane ride to get there. My two cents. This is a blog for the Documentary "Tibetan Refugee" and "Journey Into Tibet." 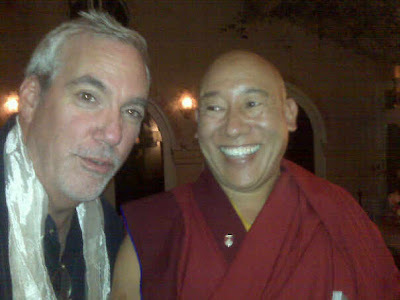 I shot the film Tibetan Refugee in Dharamsala, India a number of years ago. I was visiting Dharamsala to see His Holiness the Dalai Lama speak, and while I was there I visited with my friend Thubten Ngodup, the Nechung Medium of the State Oracle of Tibet. YOU CAN PURCHASE THEIR CD HERE. While I was there, he asked me to help him make a CD of the Nechung Monks performing live in their temple. You can find music from that recording here, or you can watch the monks in action here. Kutenla, the Nechung Oracle, suggested I make a documentary about Tibetan refugees who had just arrived after walking across the Himalayas to freedom. Even that sentence sounds difficult - and to hear their stories was heartbreaking. I discovered that people were sending their children away from their homes in Tibet so they could learn about their culture before it was destroyed by the Chinese government forever. These beautiful children were not allowed to learn Tibetan language or culture at home - and if you listen to their reasons for coming to India, you'll understand more clearly why so many people have chosen suicide, self immolation, rather than suffer further under the heel of the Chinese government. It's hard for those in the West to understand what is really happening in Tibet. It's hard for those in China to understand what is really happening in Tibet. I know, I've been to both places. In Shanghai and Beijing, they only hear bits and pieces of this outer realm, that they've been taught is part of China, but when they examine the truth and the record, can clearly see with their own eyes that Tibetans are as related to the Chinese as Africans are. But that's an argument for theoreticians - and I'm happy to make it, but not here. This is a story in the words of the people themselves. They talk about why they were forced to flee Tibet - monks who were being tortured, doctors forced to commit abortions on women so they won't have more Tibetan children. While I was in Tibet I informally asked some of the Han businessmen and women what they thought of Tibet. All ten of them said the same things; they hate Tibet. They hate Tibetan food, they hate the climate, they hate the altitude. As one businessman said "If I could make triple wages back home I would never have come here. I can't wait to go home!" What that means is that eventually - these people will grow tired of Tibet. They will never adapt. They will never consider it home. In essence it's the same as what happened to the Native American tribes in the U.S. - once the europeans had stolen all of their land, all of their oil, all of their precious resources, they left them alone. It only took 150 years to do so - but the Native American nation is rising again. The wealthiest casino operators in the world have taken their money and invested it in their people. So one can only hope that one day the Chinese will do the same. Leave Tibet. Go back home. Once they've taken all their gold and oil and precious resources, they will leave. Because it isn't an easy place to live, and only Tibetans like living there. I'm including links to two of my films here: one is TIBETAN REFUGEE. The other is JOURNEY INTO TIBET. One allows Tibetans to speak for themselves about what's really happening in Tibet. The other I shot while on a trip around Mt. Kailash with esteemed professor Robert Thurman. I could not allow my film to be political - but I felt it was important just to document what the experience is like going to Tibet. So if you have a desire to go there, enjoy this film. Both films are for sale on DVD. You can find them here. (Tibetan Refugee) or you can find Journey into Tibet Here. But you can also donate whatever amount of money you care to, so that I can continue my work and my filmmaking. If you find value, please donate. Here are the music tracks from Amazon for "Nechung Monks Live in Dharamsala; traditional chants of tibet"
And please donate if you can - I will use your donation to further this cause, thank you!!! If you like what you've read or seen and want to help me continue this research, PLEASE DONATE! I appreciate all the help and will be finding some creative ways to get this information onto the planet. Any help is most appreciated. Thank you.